I love all kind of random generators, especially random name generators, since I usually have a hard time coming up with cool-sounding character names. When some time ago Hannah Lipsky of Chaotic Shiny Productions asked the members of the #rpmn channel to help her test and improve her latest generator tool, I was more than happy to give it a try. And I actually proposed a few features that made it into the final product. and I have to admit I am extremely happy with how the Kingdom Builder turned out in its final version. The version I received for review will be available for purchase in a few days from the official Chaotic Shiny Productions page and will set you back about $4. And this is more than a fair price for a program that offers that many features. I tested the Kingdom Builder on my netbook using Windows XP Home and on my desktop PC under Windows 7 Professional 64bit. The Kingdom Builder consists of an executable file which is about 1.9 MByte in size. The program doesn’t need to be installed, so you can easily run it from your USB thumb drive. The Complete Kingdom Generator randomly generates a complete kingdom including everything from it’s ruler to a short description about the country. The generator’s results can be printed out or saved to a text file for later use. This can come in extremely handy if you need to come up with a small setting on short notice. Press a couple of times on the “Generate Kingdom” button and you have a good basis for an entire campaign setting. The currency generator randomly creates currencies for your campaign. 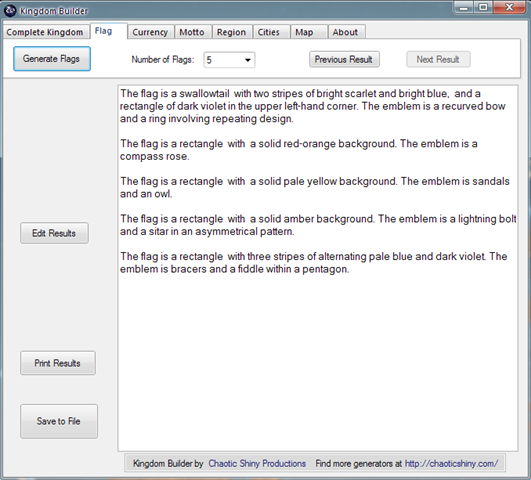 As with the Flag generator you can choose how many different currencies should be generated and you get to choose the era (either medieval fantasy or futuristic). As far as I know Hannah is currently working on a coin generator, that creates images of fantasy coinage. Perhaps a later version of the currency generator will not only generate names and exchange rates but also actual images. But even without images of the coins this generator can be very handy if you need to come up with some exotic coinage on the spot. Every proper fantasy kingdom needs a motto like “For king and country” or “Peace and Happiness”. The Motto generator creates a couple of mottos for you. As with all the other generators the interface is very simple and intuitive. The Region generator randomly generates – you guessed it – Regions. I think the examples in the screenshot below speak for themselves. The Cities generator creates a set number of random city descriptions. For some examples check out the screenshot below. The map generator is definitely my favorite generator. And it has by the far the most options. If you ask me the map generator alone is worth getting the Kingdom Builder. Let’s face it, most GMs either lack the artistic abilities or the time to create really cool looking campaign maps. And although the map generator doesn’t create maps like you would expect them from a WotC campaign setting book, you can create a complete campaign map (even with square or hex grid overlay) in no time. And you can even set certain parameters to get the map you want. Overall the Kingdom Builder is a great tool for GMs, either for preparation or at the game table. As I’ve mentioned before the tool is pretty easy to use, the interface is clean and it even runs great on netbooks (which is definitely a plus). When I think about it, it could be possible to create a whole campaign setting just using this toolbox. That’s definitely something I have to try out in the near future. But even if you just need some inspiration, the Kingdom Builder is a great resource. Thanks again to Hannah “Swordgleam” Lipsky for giving me the opportunity to review her fine product! Thanks for the excellent review, and thanks again for all your help beta testing! Pingback: Stargazer's World » Blog Archive » Six Hundred!